Texas' first office building renovation using PACE was brought to close by PACE Houston on November 15, 2017. The $1.3 million PACE loan proceeds were used to provide 100% financing for two new chillers, HVAC Controls and LED lights for both the building and the garage. Energy efficiency financing could not have come at a better time for the Houston market and for office building managers seeking to improve their tenant’s comfort and the building’s aesthetics in an increasingly competitive market. Under the new program property owners can now borrow 100% of the funds needed to make the improvements and they can pass through the cost to the tenants, who more than benefit from lower utility bills. In early 2017, the building management team contacted PACE Houston’s Tim Crockett to learn more about the program’s benefits. The next step was to find the right combination of improvements that would produce enough savings to pay for the financing and more. The way the program works is the sum of the savings over the useful life of the equipment must exceed the sum of the payments over the term of the loan. This means an owner can use a quick payback investment like window film or LED lights to carry the cost of financing a large capital asset. Because PACE financing is long term, the owner can achieve positive cash flow over the life of the project while making necessary improvements to the property. 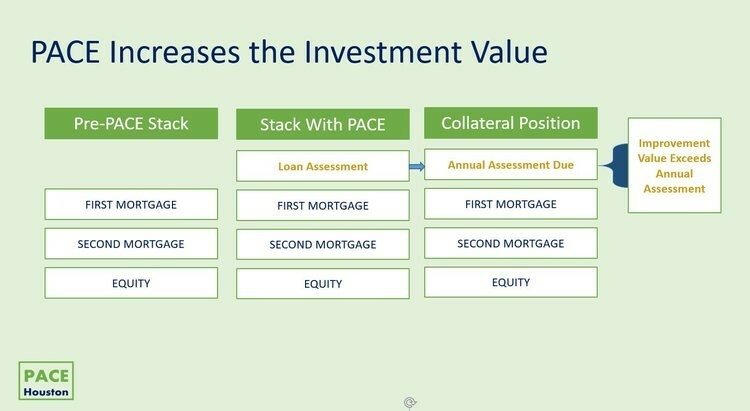 PACE Houston evaluated and compared each lender’s financing proposals, calculating an effective rate for each proposal. The lender was then chosen. In the end, the sum of the savings over the useful life was greater than the sum of the principal and interest over the useful life, and a positive investment ratio was achieved. As PACE law requires, a qualified Professional Engineer was engaged to provide an independent validation of the proposed HVAC, Controls and Lighting improvements and their projected energy savings. According to the DOE, this basic level of improvement is done frequently and is fairly easy to implement. Examples include reducing envelope leakage, revising the air filtration system, calibrating air sensors, re-enabling supply air temperature set-point resets, reducing HVAC equipment run time, closing outside air dampers during unoccupied periods, and shutting down the cooling plant when there is no load. Across the United States, one could expect an average reduction in a site’s energy use intensity (“EUI” measured in kBTU/sf/yr) of 23% by just making what you have work better and “plugging the leaks”. In the Hot & Humid Houston environment a 15% reduction would be expected – not bad for little capital investment. This is without using some more advanced energy modelling programs. This more comprehensive energy saving designation encompasses measures based on their high cost effectiveness and energy savings potential and relatively simple implementation. Examples include installing occupancy sensors to control interior lighting; adding daylight harvesting; retrofitting exterior measures to reduce lighting density and adding exterior controlled lighting; widening the zone temperature “dead band” or replace pneumatic thermostats; and lowering VAV box minimum flow set points or rebalancing pneumatic boxes. Across the United States, after a building owner completes a Standard Retrofit, according to the DOE, they could expect an average reduction in a site’s energy use intensity of a cumulative 38% (EBCx plus Standard). In the Hot & Humid Houston environment a cumulative 33% reduction would be expected. This package includes measures such as replacing a chiller, adding roof insulation/reflective roofing, upgrading to DDC controls, replacing interior and exterior lighting fixtures with LED fixtures, replacing VAV Air Handlers, exhaust fans, outside air fans, chilled water pumps, condenser water pumps, and cooling towers. Across the United States, after a building owner completed a deep retrofit, according to the DOE, they could expect an average reduction in a site’s energy use intensity of a cumulative 50% (includes EBCx, Standard Retrofit and Deep Retrofit improvements). In the Hot & Humid Houston environment a cumulative 45% reduction would be expected. * These numbers assume a 1:1 reduction in kWh used produces a similar reduction in the energy bill which depends on each property’s power contract. The first Houston project involved a deep lighting and HVAC system retrofit that included replacing pneumatic thermostats with DDC controls on an 11 story, 200,000 square foot multi-tenant class A office building. The building management’s focus was to not only improve the building’s physical plant but also the building aesthetics and tenant comfort. Tenant comfort was the property management team’s highest priority. The building was built in the early 1980's by the current owners, with later renovations to restrooms and common areas. The building complex includes a 5-level parking garage located next to the building. The building management worked with several vendors and ultimately recommended that the owners replace two chillers, two chilled water pumps, two condenser water pumps and add four variable speed drives, or VSD’s. They also replaced pneumatic thermostats with DDC controls and installed six network controllers for BACnet communication to the air handling unit “AHU” and the central plant controllers; and installed web server to host the building energy management software platform. The improvements which cost about $1.3 million will be 100% financed over 20 years at a fixed interest rate using PACE financing arranged by the owner in consultation with PACE Houston. It is expected that the projected savings will more than pay for the total cost (P&I) to finance them. Specifically, the projected total savings over the 20-year life of the project (including depreciation, energy and maintenance savings) is greater than the total of the amortized payments. In PACE measurement terms, the project has a positive lifetime Savings to Investment ratio “SIR” well in excess of the required 1:1 ratio required by the state. This type of financing is not new in concept. It is similar to Tax Increment Financing “TIF” that is used to finance capital improvements to fight urban blight or even for greenfield property developers. PACE financing is like a single building TIF. However, PACE financing is usually done when direct savings are expected and they are expected to be greater than the cost of repaying the financing (P&I). And, because PACE financing cannot be accelerated, it can improve the security of the first mortgage holder who receives the full benefit of the improvements to the property while being behind only one or two years of payments in the event cash flow issues occur in the future. For instance, if the improvement decreases utility bills by $100,000/year and cost (P&I) of doing the project is $80,000 per year, then the NOI is improved by $20,000. This represents a capitalized value of $20,000 divided by a Cap Rate of let’s say 7%, or $20,000/7%, or $285,000. This improved property value is in excess of the $80,000 in P&I due each year, paid as a property tax assessment, a line item on the tax bill. Because the repayment of the loan takes the form of an assessment, it cannot be accelerated. Thus, the existing lender receives the full $285,000 in benefit (Improved NOI/CapRate) while one year’s payment (should they be forced to repay it in the event of a foreclosure) is only $80,000.